Changing your oil & filter is, probably, the most important regulator service for your motorcycle. It is not a labor intensive service point, but it is, still, very important to take your time and be precise. You will start by loosening your fill plug and letting it rest in the case opening. This allows for venting while blocking the opening from any potential debris that may fall into the case. Remove your drain plug and let the oil drain completely. While the HD 103 oil is draining, move on to your oil filter. Use a suitable oil filter wrench to remove the filter. Be careful not to disturb or damage any surrounding sensors or wiring. Try to capture as much oil as possible when removing your old filter. Any oil that gets by must be thoroughly cleaned from the motorcycle. It is also important to remember to remove the old oil filter seal. Now, prep your new filter. Fill the new filter with 1/3 to 1/2 quart of oil and dampen the filter seal. Spin the new filter onto it’s mount and hand tighten. Next, you will prep your drain plug. Remove the old oring and clean the plug thoroughly. Then, apply teflon paste to the threads. Start the drain plug into the oil pan by hand. Snug it; and final tighten to 14 – 21 foot lbs. Now, remove your fill plug and pour 3 full quarts into the fill allocation. This is, now, a sufficient amount of oil to check your oil level. The dip stick is clearly marked for checking your oil level; either, on the kick stand, or with the m/c standing level. 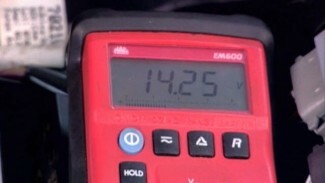 Make your final level/capacity adjustments after the m/c has been brought up to operating temperature. When the oil level falls within the hash marks on the dipstick; oil level is sufficient. Keep in mind; over filling your bike can cause serious problems, or damage. Correct oil level is of utmost importance. 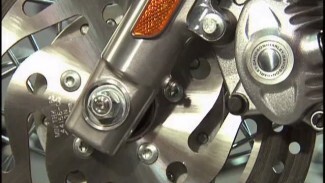 You will change your engine oil many times throughout the years of servicing your motorcycle. It is important that it is completed correctly, every time. Review these videos and review your service manual. 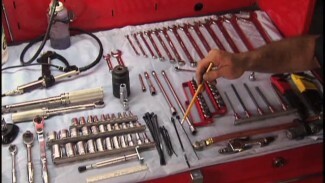 With just a few tools, you have everything you need to perform this service perfectly now and years to come.